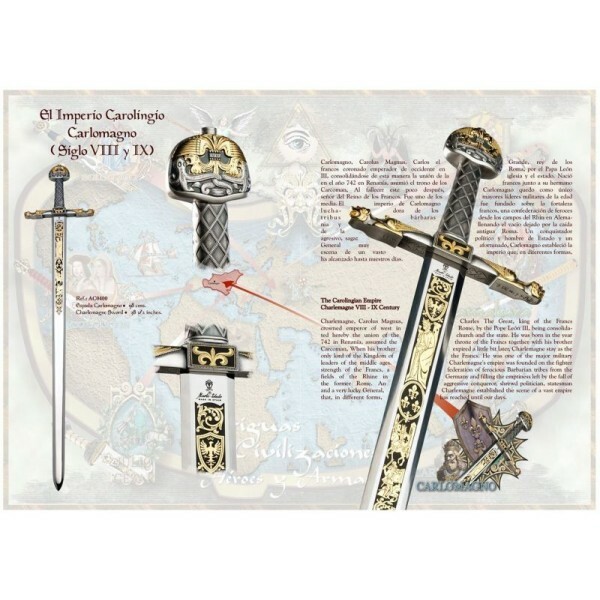 Deluxe Sword of Emperor Charlemagne - Charles The Great by Marto of Toledo Spain, pays tribute to this famous sword. Joyeuse-coronation sword of French kings, sword of justice. 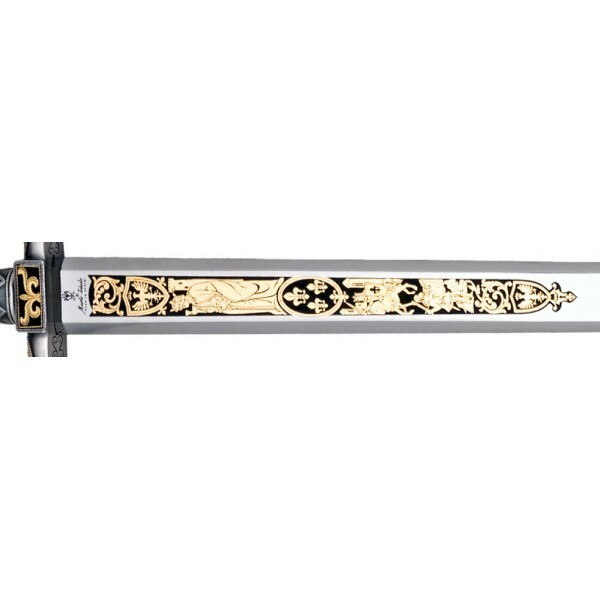 The 38 1/2 inch sword has a 24-karat gold and silver plated hilt , ornated with figures in relief. 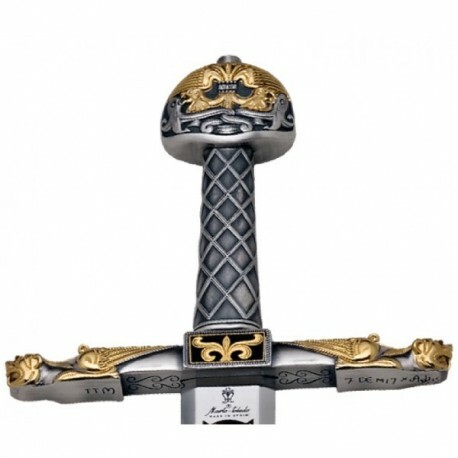 The sword is symbol of Frankish Empire and later French kingdom. The sword is symbol of law, Frankish and French justice. This Limited Edition, Deluxe Sword of Emperor Charlemagne by Marto of Toledo Spain, pays tribute to this famous sword. 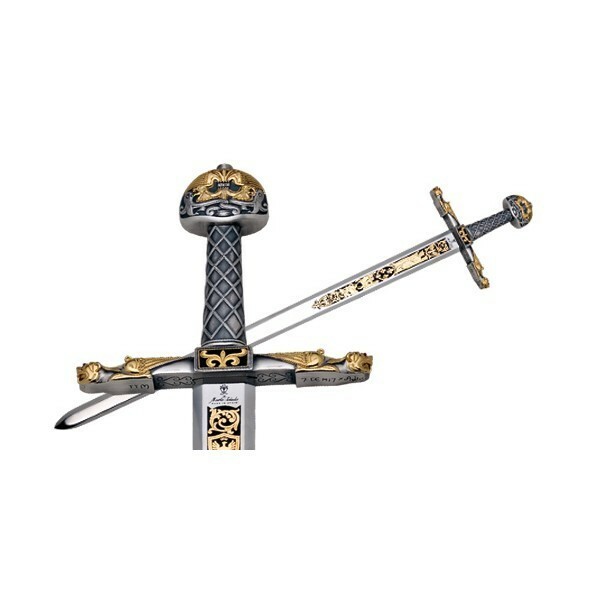 The 38 1/2 inch sword has a 24-karat gold and silver plated hilt , ornated with figures in relief. Hand grip is wrapped in fine leather. The tempered stainless steel blade also has elaborate 24K gold etched imagery that makes this a precious historic display piece. Charlemagne, Charles the Great, King of Franks, and Emperor of Western Europe, was born in 742 A.D., and became a famous commander in one of the great centers of power in history: The Sacred Roman Empire. Charlemagne's empire was based on the fighting strength of the Franks, a confederation of barbarian tribes from the land of the Rhine in German. They fulfilled the emptiness of power after the fall of the Roman Empire. Their insatiable ambition, sometimes increased due to the goal of extending Christendom, led them to France, Germany, Italy and many other territories. An aggressive conqueror, wise politician, statesman, and fortunate General, Charlemagne set the shape of the vast empire that, in a different way, has reached to modern times. The Emperor Charlemagne Sword by Marto of Toledo Spain is a replica of one of the most well known swords in the world. 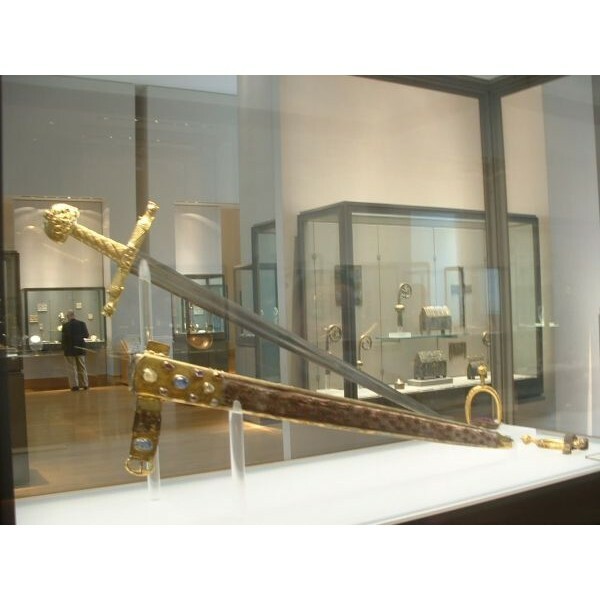 The coronation sword of the Kings of France entered the collections of the Louvre museum following the French Revolution, together with the other ceremonial items previously held in the treasury of the abbey of Saint-Denis. With some of the ornaments on the pommel dating as far back as the tenth and eleventh centuries, this sword is one of the oldest surviving examples of French regalia. * Overall Length: 98 cms - 38 1/2 inches. * Blade: AISI 440 Stainless Steel - 24K Gold etched. * Handle: Zamak - 24K Gold and Silver plated. Exquisite coronation sword of France.